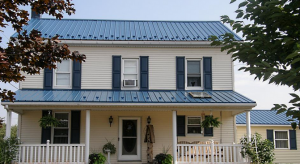 There are many Benefits of Steel Roofing. It is a great investment and will make your home energy efficient. The cost of a steel roof is certainly higher than shingles however it will also last at least twice as long which saves you money over a period of time. Climate also affects the reason for choosing a steel roof. Across Canada, we see every type of weather possibility all throughout the year and are lucky to be able to have a steel roof installed anywhere. If you are looking for an environmentally friendly option steel roofing is your best bet as it is made out of recyclables and will be recycled after its life. The design for a steel roof is commonly standing seam, which is a vertical sheet of steel and concealed fasteners. With raised seams and no roof penetrations, it helps diminish the chance of a roof leak. Standing seam panels can be manufactured from a coated steel, bare and painted aluminum, zinc, copper, and stainless steel. Another feature is the roof being energy efficient. They reflect the sun’s heat away from your home and can lead up to 50% savings. Steel roofs also come with Kynar 500 which is a factory-applied final coating that resists mildew and weather and is dirt shedding. Steel roofs are known for their longevity, durability and of course, beauty.